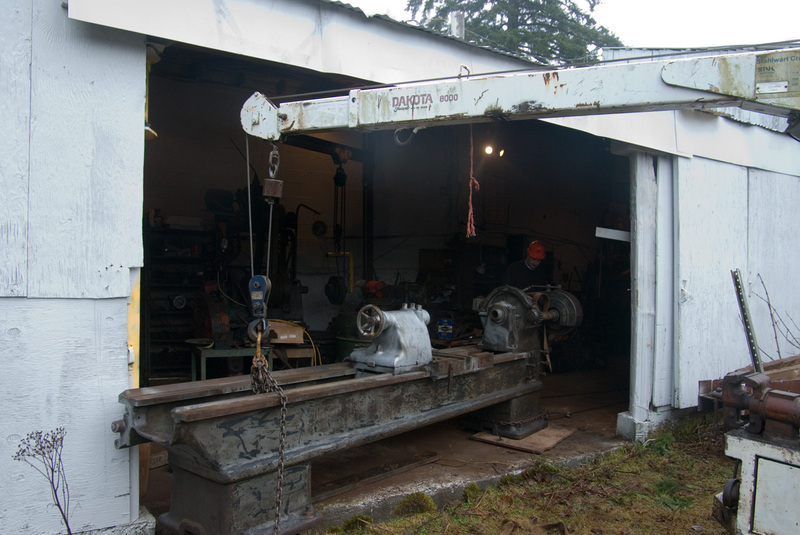 Engine Lathe -- 25" x 120"
It's Heavy --- 7,000 lbs. 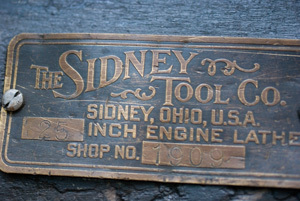 Featured here is a Sidney Tool Co. 25" x 120" engine lathe believed to have been manufactured before 1918, but after 1905 when the company was started. It has been retrofitted with a Cullman Wheel Co. "Silent Run" adapter allowing it to be powered by an electric motor instead of an overhead line shaft. 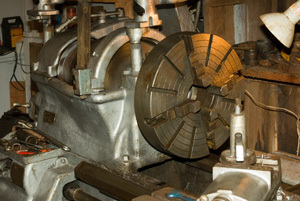 The 'Cullman Box' is actually a compound chain reduction that runs in oil which reduces the standard 1825 RPM electric motor to about 220 RPM which is the specified speed of the countershaft. 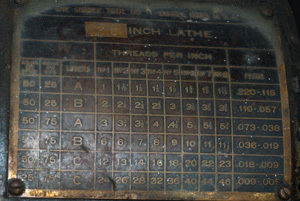 This is a Heavy Pattern lathe according the the manufacturer, implying that it is intended for 'heavier items'. It weighs 7,000 lbs. The ten foot bed was the shortest this model was sold with. Longer beds were optional in 2 foot increments to 30 feet long. 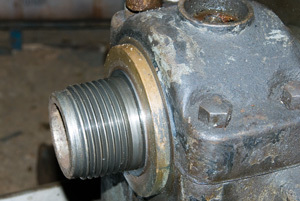 Although 'Quick change' was included to allow a variety of threads, the number of thread options could be further enhanced by changing gears on the head end. Common threads can be cut with the 50 and 75 toothed gear , but substitution of a 25 tooth gear extended the range of threads downward to 1 TPI and upwards to 46 TPI. Consistent with the 'Heavy Pattern', the tail stock has 2 clamps to hold it securely while 2 speed back gears provide extra low speeds for heavy work. 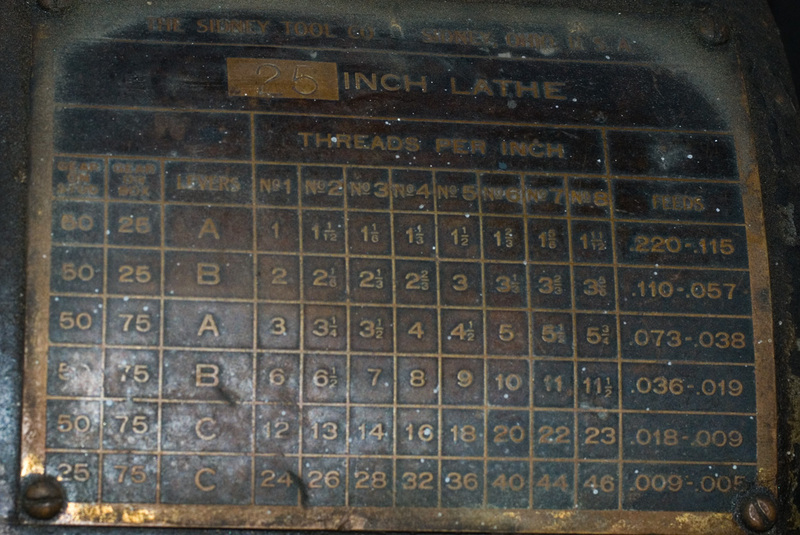 Spec sheets for early Sidney lathes can be found here. 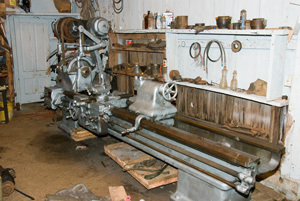 Although advertised as a 25" swing lathe, in keeping with the tradition of the times it features 27" of clearance, and was provided with a 24" faceplate. The spindle is a 3-3/4" 4TPI spindle which matches the spindle of my much larger 30/48 x 13 foot lathe. The cross slide and compound are not as robust however. Select a machineble piece of round stock 3 to 3 1/2" long. Bore it to exactly 3.5". I tried 3.4" and had to ream it out. Face off both ends until square and true. The end will hit the shoulder on the spindle and will be the alignment. the threads just hold hub against the shoulder, so threads need not be 'tight'. Proceed to cut 4 TPI but they don't need to be deep enough to be pointed. You will be there when the tops are about the width of a pencil lead. 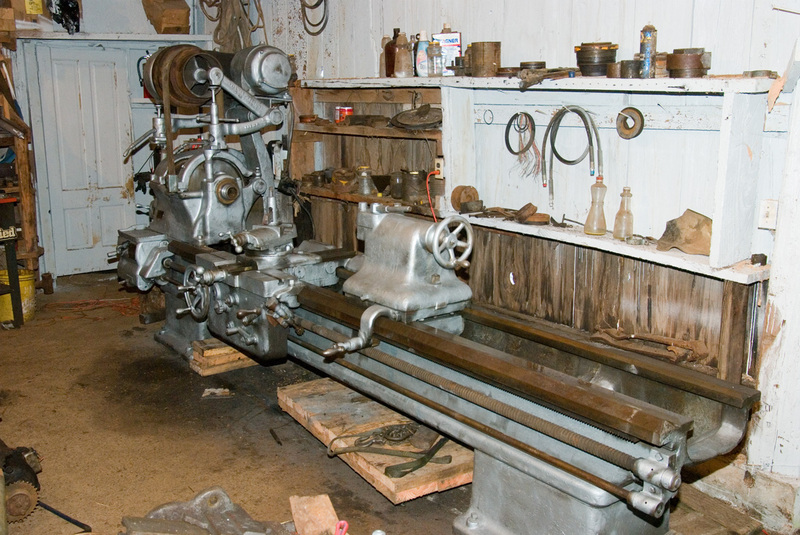 Continue until your work screws freely on the spindle. Some rattle is OK.
As the threads don't go all the way to the spindle shoulder you will need to cut away and enlarge about the 1st half inch to a full 3.75". Use die grinder and grind away completely the 'thin' part of the starter thread. When done you should be able to turn the hub on freely until the back end of it seats against the shoulder on the spindle. 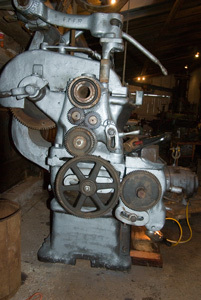 Install the hub on the spindle of the target lathe, and face off the end of the hub true to the lathe. 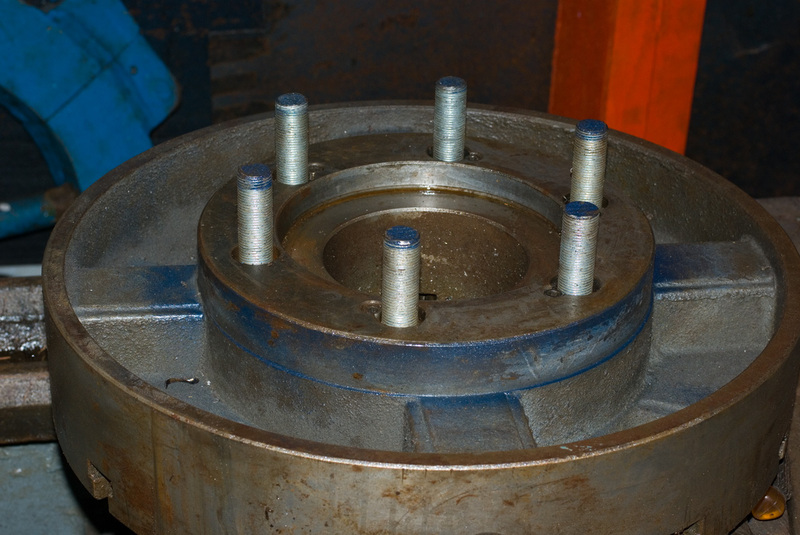 Prepare a round plate suitable for welding to the front of the hub and bolting to the chuck. Turn a shallow recess on the plate that the hub will just fit into to identify the placement for welding. 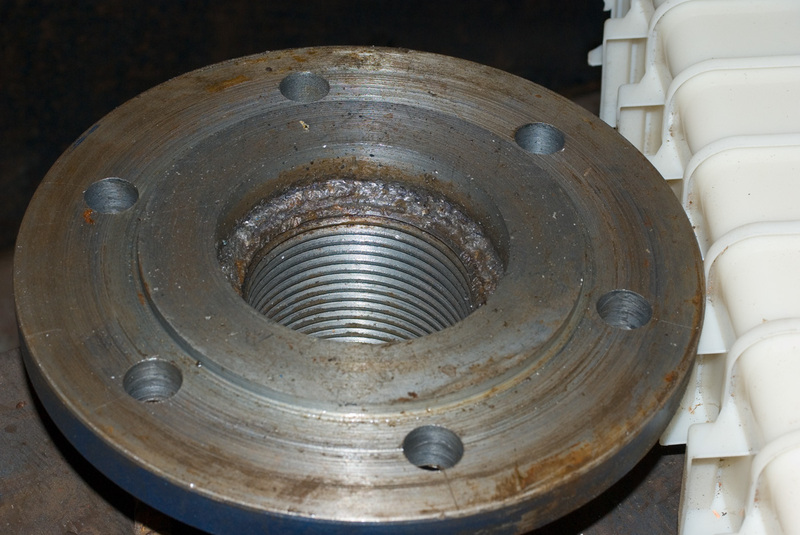 Weld the plate to the hub with Low hydrogen welding rod such as 7013 and let it cool out and sit around for a while. Some people will anneal the welded product at this point by heating it to over 500 degrees and cooling it slowly. Baking it in a kitchen oven at the highest possible temperature, and eventually turning the over off and leaving it undisturbed until cold is one solution. Inspect the weld closely for cracks. Remount the hub on the target lathe and face off the adapter plate. Turn the pilot on the plate. Mark and drill holes in the adapter plate as necessary to bolt the chuck on. Make sure the holes are big enough that no bolts bind in them. Remember, the pilot is creating the chuck alignment. The bolts are to keep the chuck from falling off the pilot. The A and B type chucks can be easily mounted this way. They will have Allen head bolts extending through from the front near the center pilot. The pilot is actually tapered some and if you match the taper you will get the best fit. The Size of the pilot will depend on the size class of chuck you are mounting, but the technique is the same and the bolts come in from the front of the chuck and you need only drill and tap bolt holes to receive the bolts. The D1 series chucks are more difficult in the small sizes. These are the chucks that have cam pins sticking out the back, sometimes called Cam-Lock chucks. The Pilots are identical to the A and B series including the taper. The cams are easily removed. They screw in the back of the chuck and are held from turning by an allen screw beside them. The specifications for the threads on the back of the cams are easily found on the internet, and you can replace the cams with stud bolts made out of "all thread" and bolt the chuck to appropriate holes drilled in the plate. To the left note the photos of the chuck with stud bolts and the plate. This technique is also usable for the D1-8 chuck mount, however with smaller mounts the studs will conflict with your hub leaving no place to put the nuts. I have worked around this by drilling the back of the chuck outside of the diameter of the chuck mount and threading the back of the chuck and then bolting the chuck up on the pilot with cap screws from the back. If it is a scroll plate chuck you will need to take the chuck apart and verify that you can safely drill the back. Alternatively some chucks have a bolt circle at the outer perimeter of the chuck which holds the back on. You may be able to use longer bolts and secure the chuck to the plate in this fashion. Flat back chucks have similar issues. Usually they have a larger pilot which is not tapered. 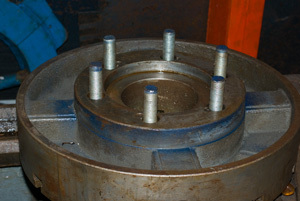 The plate will need to be sized to include both the pilot and the bolt circle. Usually the bolts will come through from the front, but if they don't small bolt circles may conflict with your threaded hub. 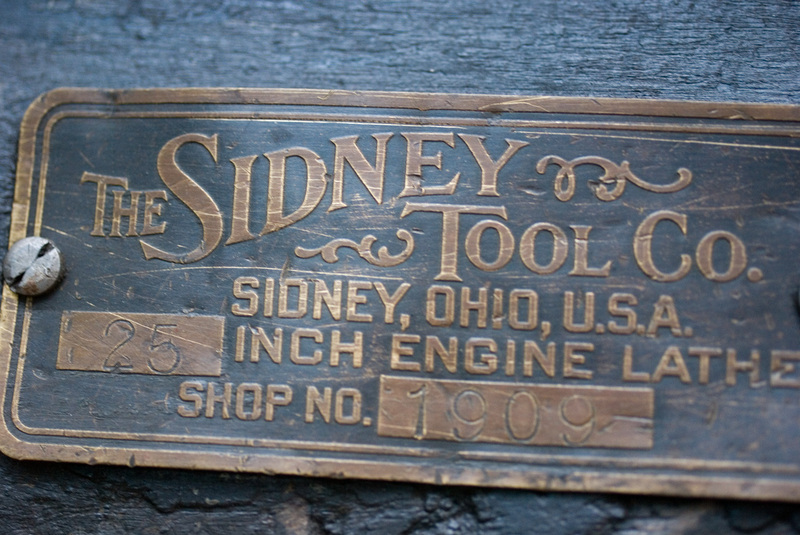 The Sidney has a fairly large spindle which makes for more conflicts than than are common with the lathes which have smaller spindles. One possible work around is to actually use 2 plates. You have the first plate welded to your hub, and the other plate bolted to the chuck (with countersunk bolts) and they you bolt the two plates together. While there are some ugly stories around about later Sidney lathes with gear heads associated with the fact that some had 'herring bone' gears in them, the Sidney featured here is an old fashioned one with very generic gearing. While it is a 'quick change' lathe with 24 different settings in the quick change box supported by an 8 gear cluster and 3 range changes, it also supports a still greater range of threading by changing some gears on the head end. 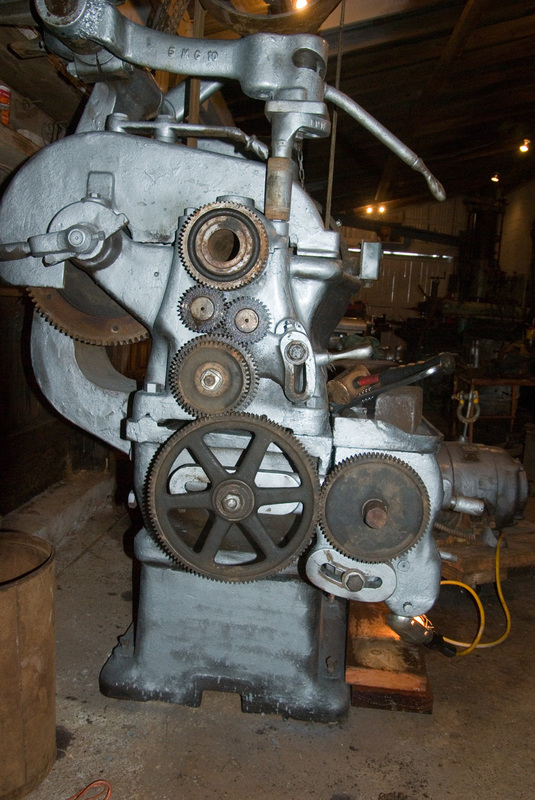 It was sold with 3 gears for the head end, a 25,50, & 75 tooth set. While most common threads are managed with just the 50 and 75 tooth gears, the range is expanded by using the 25 tooth gear in place of one of the others. 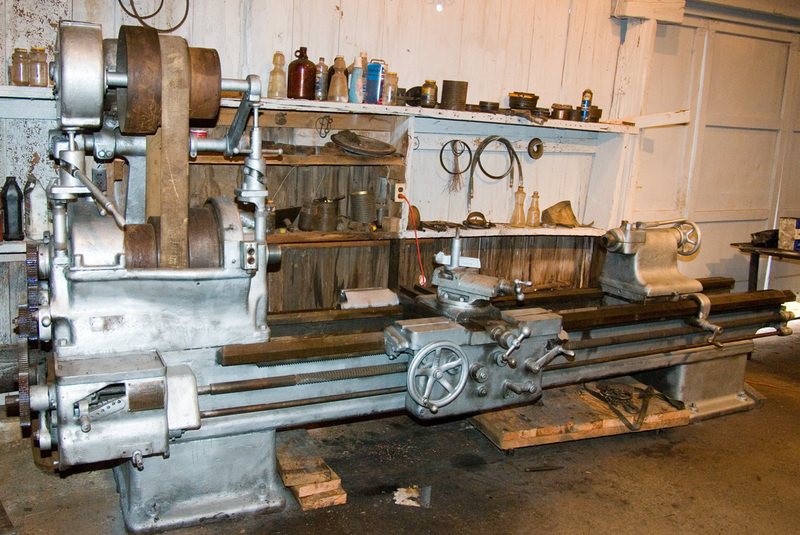 Somewhere in the last 90 years that stray gear has been misplaced and did not come with the lathe. 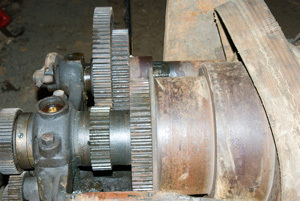 I devined that some of the gears on the lathe were apparently replacement gears and were Boston Gears of the YF series. I went to Boston Gear Co. website and found the missing gear listed in their catalog as a 'YF-25-1'. The YF tells you the series which has a Diametral pitch of 10 with 1.125 face. The 25 is the number of teeth, while the 'dash 1' tells you it should have a 1" bore and a keyway. These gears are very easy to get the tooth count. You can measure the diameter of the gear to the 1/10 of an inch and subtract 2, thus a 50 tooth gear will be 5.2" in diameter. They are 20 degree pressure angle gears. I needed to order the 25 tooth gear because it is missing, and a 60 tooth gear because it had a broken tooth. Both are listed in the Boston Gear catalog. Of these it would seem that 80/63 would fit the best and since I have an 80 gear, it looks like getting a 63 tooth gear would be the choice.